cf. 2005/1999, 2006, 2007, 2008, 2009, 2010, 2011. Lookout Mountain is an icon of the South. As a kid, en route to see my grandparents in Alabama, we’d circle the hump-backed juggernaut as we passed through Chattanooga. It’s lore was spread via one of the most innovative advertising campaigns in history — painted barns throughout the South emblazoned with “See Rock City,” a simple message that brought the Lookout Mountain tourist attraction to from obscurity to prominence in the twentieth century. Lookout is by far the steepest – 2.3 miles at a 8-10% grade with a 18 – 20% grade at the top. There is a rest station right before the climb. My family met me here, which was a bit of encouragement, since none of the other riders seemed to be talking about what was before them in great detail. Only a sense of doggedness was evident, with sparse tips here and there (save weight by not loading two full water bottles, as there’s another food station at the top). After too long procrastinating the inevitable, I mounted up and turned the corner to Burkhalter Gap Road. Remember those old photos of the Alaskan Klondike Gold Rush? You know, the ones with prospectors lined up, single file, slogging up a mountain pass? Minus the snow, the view from the bottom was pretty similar. As I turned the corner and looked uphill, a line of slow-moving cyclists angled upward as far as I could see. The grade looked manageable as I rolled over the electronic timing mechanism that marked the showcase climb. However, it didn’t take long for my already weary legs to run out of gears. On my compact gearing setup, 34×26 is as low as it goes. A quarter mile into the ride, I had bottomed out. The temperature was hovering around 90 degrees, and it became difficult to turn over the pedals even in my lowest gears. Here’s where I wish I could tell you I fought the good fight and disregarded the burn in my legs and powered up the mountain on guts alone. I wish I could tell you that, but here’s what really happened: About a mile into the climb, I noticed a shady spot on the side of the road. My tumble into temptation began here. The mirage effect took hold. It was so hot, and that spot looked oh-so-shady. Just a one minute rest to get my heart rate — already near maximum — settled down. One minute, no problem. I paused for about 60 seconds. The problem was, once I began the ascent again, it didn’t take but about 15 seconds for my heart rate to again max out and for the burning in my legs to ignite anew. About 1.5 miles into the climb, I paused again. After another quarter mile, I rested yet again. As I encountered several riders walking all the way from the halfway point in the climb, my hopes were fading — this mountain was tough. I have ridden similar climbs before and survived them, but this climb, at this stage in the course — had become a menace. To our left, the heroes of the day powered up — all standing, and all zig-zagging up the slope with barely enough momentum to keep their bikes upright. I looked over with admiration at those who summited beneath the red archway with grunts, pains, and gasps. There was no shame on my part at the time. After all, I had done all that I could do. The haunting would come later. No one lingered long at the rest station atop Burkhalter Gap — there were still 18 miles to go. At the top of a mountain, one would think they’d be easy miles, but at that stage, nothing was easy. It’s that point in a monumental effort when quitting is out of the question, but continuing cuts you to the core. The long, gradual climb up Lula Lake Road was just long enough to be disheartening, when I encountered two twelve year-old boys on the side of the road clapping and yelling encouragement, calling out riders by number (who says there’s no hope for America’s youth?). When it became apparent that there was nowhere else to climb, the police officer holding traffic shouted enthusiastically to the small, disheveled group of riders I had joined, “It’s all downhill from here, boys.” Music to my ears. The 5-mile descent down the scenic Lookout Mountain highway is harrowing. Fast downhills are tedious enough, but with constant switchbacks with tourists crossing the road, it was no time for a weary cyclist to be groggy. I “saw Ruby Falls” in the blink of an eye. Make no mistake, it was fun, but I’m often just as relieved (in a different way) to reach the bottom of a mountain as I am the top. 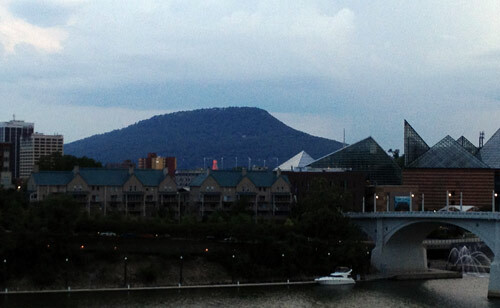 Immediately upon reaching the base of the mountain, I was back in downtown Chattanooga, and the two miles back to the finish at the stadium were largely ceremonial. Just like the rest of the preceding 100 miles, all intersections were manned with cheerful volunteers. An immense sense of relief came over me as I rolled into the stadium parking lot to the finish line where bounteous refreshment awaited. A short two hours later I would be asleep after simply just stretching out “for a moment.” I slept well that night, but it wasn’t long until that last stretch of Burkhalter Gap Road began to haunt my dreams. The showers drenched, but didn’t dally. By the time I made the turn onto the rough rural roads of northern Alabama, the rain had ceased and a steamy vapor began to rise from the pavement. Aside from the bad roads, there was little clue save for a sparse state road marker that I was actually in Alabama, but the Sand Mountain climb soon gave all the verification I needed. The climb, up what is apparently known as the “goat path,” is wooded with switchbacks and is not too steep, but long enough to make you use your lower gears (the website’s promised “2.5 miles at a 6-7% average grade” is about right). It was still early enough for the field to still be pretty crowded, and the roads were wet, it was a fun climb. 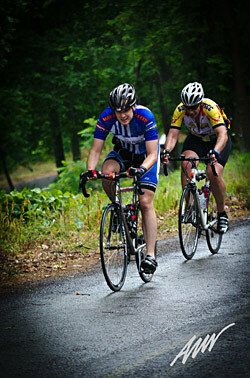 I began to see, however, that my fellow riders were no novices when it came to climbing. I did my best to make a good show to the top, but having two mountains down and only one to go offered little comfort. Though still 50 miles away and out of sight, Lookout Mountain’s Burkhalter Gap still loomed large. Geographically, Sand Mountain seems more like a large plateau. Once on top, the course went on for miles and endless miles of rollers and flats. Two rest stations at around 34 and 55 miles broke the monotony a bit, but large stretches of long, straight roads where you could see cyclists for miles both forward and backward nearly made monotony a mountain of its own. As I pushed through those desolate miles, a couple of guys in a paceline (with powermeters!) took pity upon me and invited me to join in with them. I took a few pulls on front and rotated through for about 15 miles until we joined with a larger group and the pace ramped up. Too blistering blistering for me, I was dropped, and dogged out the rest of the rolling plateau on my own. As we neared the descent of Sand Mountain, we crossed into Georgia and began to see some stunning views from the mountaintop into the valley below. Also coming into view was Lookout Mountain, just across the way, waiting patiently. Finally, Sand Mountain had come to an end — the only place left to go was down. The descent was fast and furious, but not fatally so — despite the ominous rescue vehicles parked at couple of the switchbacks. Once at the bottom two roads diverged in a wood. Would I take the one less traveled on, leading me back to the finish via the 90-mile route? Or would I turn right with most everyone else and face the suffering that awaited me on the legendary climb up Lookout Mountain? Given the recent Lance Armstrong and pro cycling doping scandals, I thought it might be worthy to show what the cycling world looks like more often than not — that is, undoped, unpaid, underprepared, and wickedly fun. What follows is a report (in three parts) from an ride I undertook earlier this year. In the opening to the band Alabama’s song “Mountain Music,” an old man wearily groans, “See that mountain over there? One of these days I’m gonna climb that mountain…” We’re not told why the old man wants to climb the mountain. Perhaps it’s the clichéd “because it’s there” or perhaps he simply needs to get out of the valley. Whatever the reason it is that we scale such heights, there was plenty of mountain climbing available in Chattanooga’s 25th Anniversary 3 State 3 Mountain Challenge on 5 May 2012 — and for me, some left over. The century bicycle ride wasn’t the first 100- mile trek I had done (I rode the excellent Storming of Thunder Ridge in central Virginia in 2011), but this course certainly put me in my place. More about that later — for now, let’s start at the beginning. With around 1500 riders in the race (I think, judging from the finish results), the starting line was pretty crowded. Keep in mind, this is only the third organized ride I’ve ever done, but it was by far the largest group. The start outside Finley Stadium was well-orchestrated, however, and traffic was managed to keep us all riding smoothly to the first climbs just outside downtown Chattanooga. Thankfully, most other riders were more experienced than me with pack riding, so it was relatively safe. I did, however, have to make an emergency stop to retrieve a water bottle when I veered onto an outside-lane rumble strip on a descent that sent my much-needed 2nd bottle into the ditch. 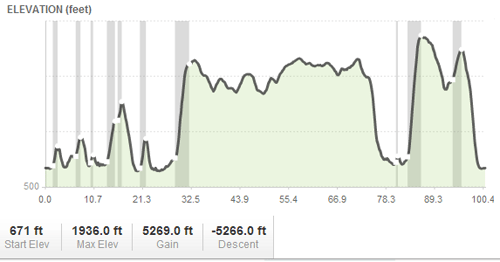 As you can see from the course profile, it wasn’t long before the roads began going up. The first “real mountain” was a short, gradual climb up the side of Aetna Mountain. I mean no disrespect here, but the only way I could be sure that we were on the mountain was by looking at my odometer — it was that easy a climb. It did have a fun and fast descent where I picked up my maximum speed for the day (42mph) on the long and straight ride down to the water. Shortly thereafter, we reached Ladd’s Mountain — a smaller but similar climb to Aetna that doesn’t figure into the “3 Mountain” count. Ladd’s seemed to take as much effort as Aetna, and was easily manageable. Upon the descent of Ladd’s Mountain, I reached the first food station at 23 miles, with dark clouds looming overhead. I had learned from my previous century that the first rest station one is not one at which to make a pit stop. The lines were long, so after a quick top-off of my bottles, I was quickly back on the bike, but I was too late — large, heavy drops of water began to fall from the sky. As a kid, I remember playing catch with my Dad when he would throw peculiar pitch that didn’t spin like the others — it sort of floated in the air without spinning and seemed like it would never get to my glove. It was, of course, a knuckleball — a pitch that goes against everything that high-heat baseball pitching stands for. Knuckleball!, a new documentary released last month in select theaters and on Video On-Demand, follows this unorthodox pitch through the lens of two of its purveyors: Tim Wakefield of the Red Sox — who made a career of the knuckleball, and former Tennessee Volunteer R.A. Dickey, who has blossomed onto the scene with the Mets in the last couple of years following a long difficult road as a conventional pitcher. The film follows the pitch and its pitchers as a metaphor for life: You can’t control it, and once it leaves your hand, it has a mind of its own. Conspiracy theorists may operate under the guise of seeking truth, but in reality they’re driven by cynicism. Any new revelation casts further doubt, and truth becomes separated from the seeker by a cloud of suspicion. Hence the Jesus of The Da Vinci Code is unknowable, shrouded in codes. Last week, I got my Virginia voter registration card in the mail. My wife’s card also arrived on the same day. So did the card above, which is neither mine nor my wife’s. The address is correct, but the name (blurred intentionally in the photo) belongs to a previous owner of my house. A previous owner who has obviously not yet moved his registration since he lived here six or seven years ago. This isn’t merely a credit card application — something the previous owner still receives a lot of at my house — but a voter registration card. Just this week, a Pennsylvania judge suspended a state law until after the election that would require voters to produce a photo ID in order to vote. My situation shows why such a measure might be a good idea. Were I someone without scruples (I indeed have a few, after all), I could theoretically go in the morning with the above voter registration card (vote early), and cast my ballot Chicago-style as the previous owner of my house. Then, just to give it some space, I could return I the evening and vote as myself (vote often). There’s little beyond my own moral sense (and fear of God) that could stop this from successfully happening. Mind you, I’m not going to vote twice, I’m simply pointing out how easy it is for fraud to occur without a photo ID. I still haven’t heard a sensible argument along the “disenfranchisement” lines against photo IDs for voters. If you have, please enlighten me. The summer between my freshman and sophomore years in college, I somehow ended up in my church’s lending library. It was an improbable place for me to be not because I wasn’t active at the church (I was) or because I wasn’t a reader (I was), but because the holdings in that particular church library — like so many church libraries — weren’t what one might call “high caliber.” This is to say that most of the volumes were fluff of one flavor or another: Christian pulp fiction, inspirational-motivational manuals, and light topical teachings. There was even a series of 30-year-old filmstrip guides on how to be an effective church usher. Not the sort of fare in which a thirsty Christian college student would be interested. One book, however, did catch my eye. There were actually two copies, which may have helped it find my attention. They were yellow hardbacks (the dust jackets were long gone) with the title written on the spine in one of those typefaces that could only have come out of the 70s. The book was Born Again, by Charles Colson – the former Nixon hatchet man’s memoir of the Watergate scandal, his conversion to Christ, and his subsequent imprisonment. I had recently heard a speaker on campus reference Colson, so against what I thought at the time was my better judgment, I checked it out. It was the first spiritual biography I had ever read, and really the first Christian book outside of the Bible I had ever read. I was riveted. Decades after Watergate, the term “born again” is most often used adjectivally to refer to certain kind of Christians — you know, the ones who teeter on the edge of fanaticism. But in reality, being born again is the essence, not the adjective of Christian conversion. Colson’s faith and transformation seemed something that could only have been wrought of God. Unless one is a slave to the bestseller list, a good reader of books follows the links from one good work to another. While I can’t say Born Again was the most influential book in my formative years, reading Colson’s gripping, unapologetic biography started me down a path that has undoubtedly shaped my thinking and thus my actions today. I saw him speak a few years ago, and the way he married his passion for Christ with intellectual acuity is a model for all in the service of the Kingdom. May he rest in peace.